See more: Download ELVA-1 FOD radar presentation (zipped PowerPoint, 1.5 MB). The history of aviation knows many cases in which debris objects on runway caused sufficient damage to the aircraft during take off or landing. Due to the relatively small size of FOD debris, a high resolution radar is required to find and locate such objects. ELVA-1 FOD radar operates at 76 GHz (3.9 mm wavelength) in frequency-modulated continuous-wave (FMCW) mode. FMCW radar determines distance to the target (FOD object) by detecting the frequency difference between the received and emitted radar signals. The advantage of ELVA-1 FMCV radar is very low transpired power which doesn’t harm airport personnel or people inside aircrafts when getting into beam. Another pros of ELVA-1 radar are market-winning range distance, motorized radar positioner with 180-degree search area, and relatively small size of the radar. Ability to detect debris which is equivalent to FOD reference sample as metal cylinder sized 3.1 cm length and 3.8 cm in diameter, at 1000 m distance. 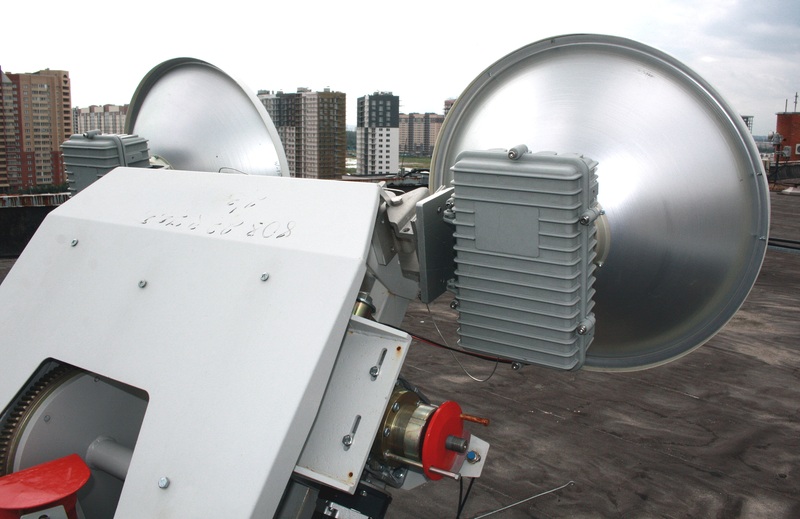 ELVA-1 FOD radar is long-range device with 1000 m radius of operation. On the market, this range is one of the longest, allow to use 1 to 3 FOD radars for runway. 1x FOD radar for runway at regional airports o A runway of at least 1,829 m in length is usually adequate for aircraft weights below approximately 90 tons as Airbus 319, Airbus 320-100 or Boeing 737-800. 2x or 3x FOD radars for runway at any international airportso World’s most busy airports like Frankfurt or Singapore have runways of 4000 m length to land Boeing 747 or Airbus 380. 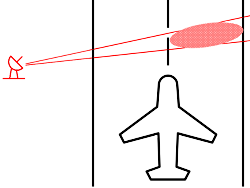 Thus, 2x FOD radars will be required for each runway. The world's longest runways are ones at Qamdo Bamda Airport in China (5,500 m) and Zhukovsky Airport, Moscow (5,400 m). In such cases, 3x FOD radars will be required, similarly. 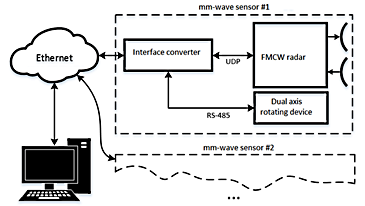 FOD radar provides raw binary data, so it has to be connected via Ethernet network to airport control / monitoring system for data processing andvisualization. 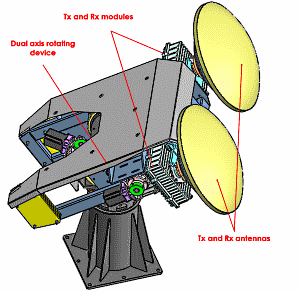 The structure of each FOD radar (also named as mm-sensor) consists of FMCW radar and Positioner (rotation device). RS-485 to control unit of Positioner device. Detailed description of radar raw data specification, intended for external computerized control system. Radar Operation Manual in PDF. Additional software for radar output data conversion can be developed by ELVA-1 team according to customer requirements. 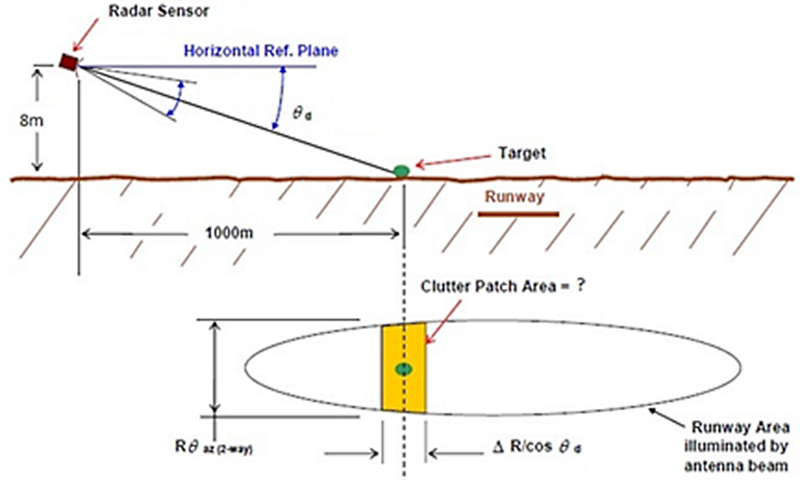 Radar scans runway within 180-degree from its point automatically adjusting beam elevation angle to keep it over runway surface. 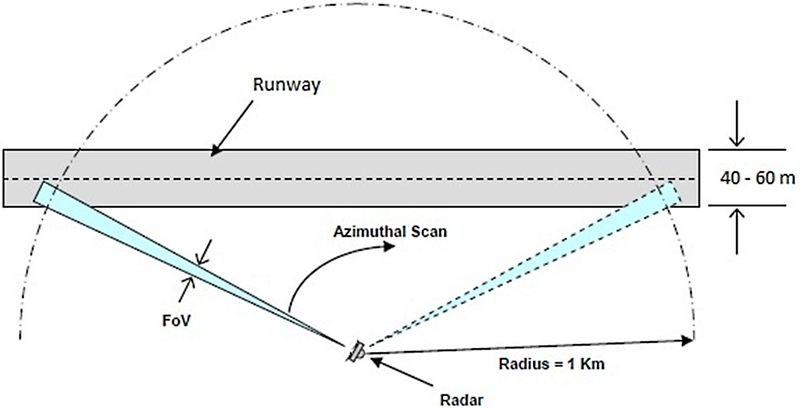 Radar realizes loop-like scan by ½ of runway width along its length.